The temperatures dipped below 12f degrees (-11c) for two nights and then 15f. Tonight is a balmy 28f, but the snow is supposed to start again tomorrow, before the big snow hits next week. I took my decrepit ca. 1999 Walmart-sorels out of storage and shook out the spiders. Every night I bring in the hummingbird feeders, creep out at dawn in my bathrobe to hang them up. In the morning, I pour hot water on the aviary gate to get it open, then come back with more for the actual animals. This morning, the dove cage door was frozen shut. I’m thankful that Dobby is not suffering through this cold spell. He had arthritis in his front right paw, and those of us with arthritis know how painful that is on cold winter days. He especially disliked snow. He’s young in this video, and it’s one of his first snowy days. He was Not Amused. Winter means trouble for capybaras. Their range in South America is roughly equatorial, and even Florida has more wintry days than those tropical countries. When considering capys as a pet, climate is an important consideration. Not only do they not tolerate cold well, but they need year ’round access to swimming. Dobby was confused about his frozen swimming pool. The ice was about 3-4″ thick, so even if he was silly enough to walk out onto it, he wouldn’t crack through the ice. Once the ice began to thaw, I fenced off these steps until the ice was completely thawed. Capybaras are good swimmers, but if they should fall through thin ice, hypothermia would set in just as it would for us. I’m not sure I could even have gotten him out of there. Dobby steamed after Jillian poured warm water over him. Capybaras have a thick leathery hide, but they get rough, scaly skin if they don’t spend enough time in water. Volunteers loved to pour warm water over him in the winter. He also had a “hot tub.” I had hot water plumbed to a hose bibb in the back yard, and an endless supply of these hard plastic wading pools. They are easier to bite than you might think. He liked his steamy “hot tub” and would wait patiently while I heated up the water. When he was young and foolish, he would brave the weather. He would follow me while I did my chores, but we never stayed out long. The older-but-wiser Dobby would often decline the invitation to graze in the front yard when the ground was frozen. He would look at me and pointedly hold up his little paw, as if to say “No thanks, it’s too cold on my feet today.” He knew I would pick him a bucket of bamboo, anyway. This year, the snow is so deep, and the cold so persistent, that the bamboo hedge has completely disappeared beneath the blanket of white. Dobby, sitting by the heat register, contemplating his bucket, wondering where the bamboo disappeared to. The forecast is for at least another week of freezing weather, and the weathermen are bragging about the foot of snow we might get, as if there is a prize for it. This year, Dobby would have had to spend about two straight weeks indoors. This is about when Seattleites start yearning for rain. Dobby’s last snow, January 2018. He walked this far out, turned right around, came back into the kitchen. Dobby slept in the kitchen on cold nights. As a young capybara, he was nocturnally restless and I always found him outdoors in the morning, trying to huddle beneath frozen blankets. The old Dobster became used to the slumber parties and he resigned himself to sleeping all-night in the kitchen. It was a relief not to have to check on him every two hours all night long. Not that I would have had much luck persuading him to come back inside. Maybe he would have liked staying in better if The Bartender had let him have the remote control. Anyone considering a pet capybara ought to consider their climate realistically. Seattle’s “mild” weather is marginal, in truth. Five week old Dobby caught pneumonia from only 20 minutes on the freezing tarmac in his shipping carrier when I brought him home. The little pups are quite delicate. They also need lots of direct sun and fresh grass when they are growing, and that is nearly impossible to achieve in a cold climate. He’s sitting in a small tub of warm water. Let’s talk about frostbite. Capybaras are tropical animals, and in their native climate would never experience frozen ground. Unlike penguins or polar bears, they just aren’t equipped with biological mukluks. If we could see the bottoms of their feet, we might have better luck preventing frostbite. Considering how often I hear about it, the best way to prevent it is to limit snow time, especially for younger animals. This is only about ten steps away from the kitchen door. Though the ROUS Foundation hasn’t seen any necropsies with frostbite as cause of death, anecdotally, I know of six deaths from frostbite. The first one I heard of was up in Canada. The capybara decided to push open his outside pen door one night and got frostbite and it was treated with antibiotics. The infection was persistent, though, and in spite of ongoing veterinary care, salves, soaks, bandages, and everything else they could think of, the capybara finally died of the infection in late April of that year. The warm water is only deep enough to cover his feet and bum. The second time I heard about frostbite was in two young capybaras in that super-snowy area of New York. It was a sudden, intense winter there, snow up to here, and two frisky capys. One was about a year old, the other about 8 months, and one, then the other developed frostbite. They were brought into the house, which isn’t as much fun as it sounds. The feet became infected and they wouldn’t leave the bandaging alone even though being in the house allowed the owner to watch them carefully. The infections got them both by spring. The owner has since moved his menagerie to Florida. He started eating snow so I gave him a bowl of drinking water. The third case involved three infant capybaras that managed to slip out the barn door. They all had frostbite on all four paws. I wish I could un-see the photo sent to me by the veterinarian. I never heard about those triplets again, but I think I know how it ended. He tried to enjoy it. Capybaras tend to go walkabout. I know of several who wandered away in mild climates never to be seen again. I can think of nine pet capybaras currently living in cold climates such as Canada. If they wander in cold weather, they can die of exposure. I heard of one who squeezed out through a gate and perished in the cold snow overnight. Steamy warm paws are not immune to frostbite. Do you remember the High Park capybaras? They escaped a zoo in Toronto one summer, two of them, as a new animal was being delivered. They were walkabout for a month, but after a concerted effort, they returned home. You can bet the zoo is more careful now to secure this sneaky couple. They were busy while they were “out” and had a litter of pups that following winter. Northern zoos usually have nice heated barns for their capybaras. I think the Montreal capybaras even live in a biodome, a tropical habitat. The Japanese zoos all provide onsens (hot tubs) for their capybaras in winter. Dobby’s night pen was heated, but it wasn’t very efficient below 22f degrees (-5c) and that’s when I made him sleep indoors. If you don’t have a heated barn, and your winter temperatures dip below freezing, you ought to be thinking about which room of your house you can readily accommodate with hay, bedding, bathing, and toilet facilities for your capybara. 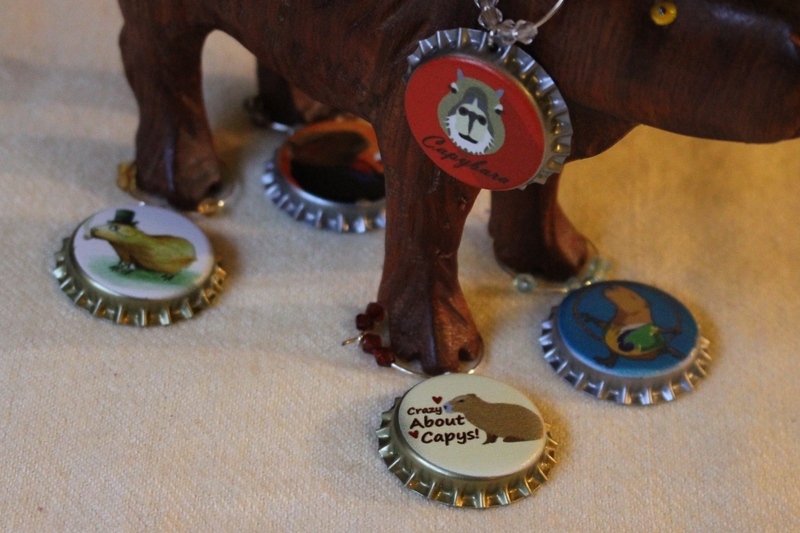 ← What is a capybara?